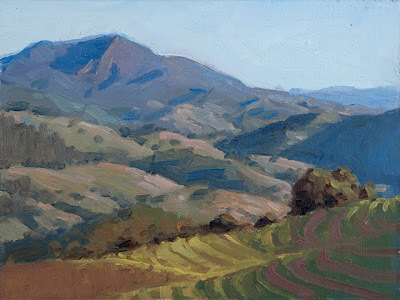 Last weekend, Ernesto and I went out painting on Alexander Mountain, above Alexander Valley in northern Sonoma County. The weather couldn't have been more perfect, better than the typical Bay Area summer day. The rust was very thick and all I could think about was remembering a quote (I think by the great Edgar Payne) something along the lines of, "Nature does not scatter pearls for lazy painters". I kept thinking that she doesn't scatter pearls for rusty ones either. 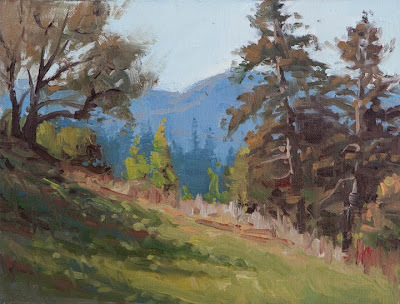 Still, it was wonderful to be outside and painting. Looking forward to going again soon! Both studies are 8x6, oil on linen.